Most mornings, I make my way to a bench at the edge of the North Saskatchewan River valley in Edmonton. 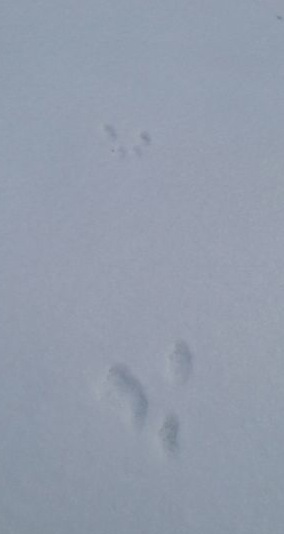 At the beginning of winter, with a wee bit of snow, I am able to see how many people travel and where they go, and other creatures that travel by land. Winter reminds me that it’s a big world to explore, with a big, ever-changing sky and variable conditions. Along with the coat, hat and mittens, my footwear needs to change in anticipation of the depth of snow I travel through. 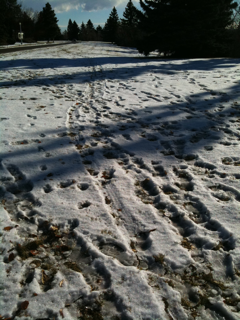 There are conditions where I fall right through, and other days when I can travel on top, and snow on ankle skin is not comfortable. 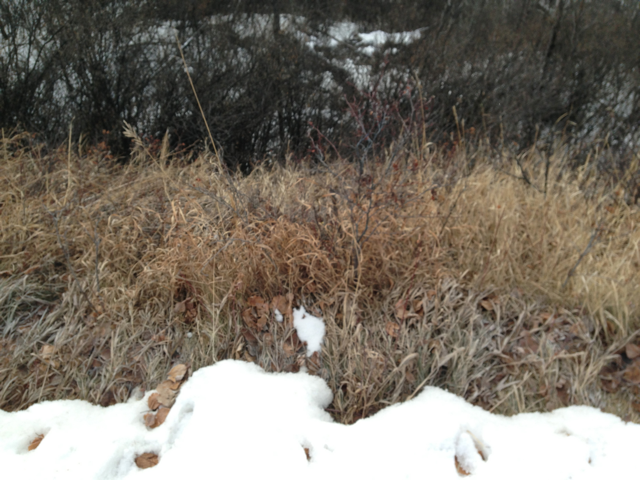 As I explore my city from my perch, I now notice the snow receding, leaving grass flattened and exposed for new growth in the spring. 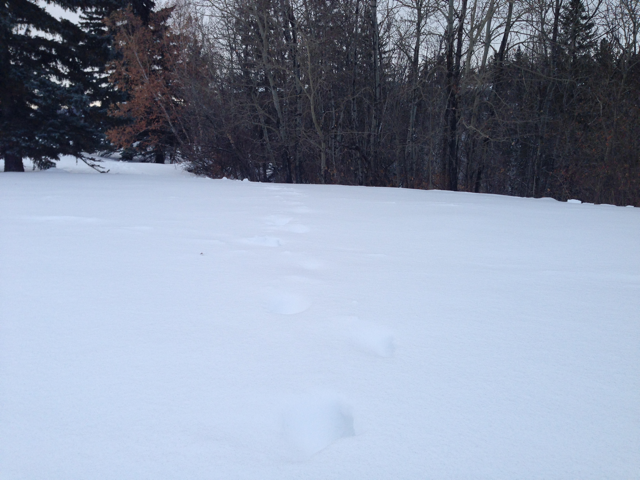 I see now that when spring arrives shortly, I will miss the footprints, revealing who travels here with me, big human creatures and other small ones who move through when I am not here. I appreciate winter’s reminder that I can not see all there is to see. There are possibilities unknown to me. What practices do you engage in to find possibilities unknown to you? My ability to ‘perform’ well, regardless of what is coming at me, has a lot to do with how I prepare. Being prepared means I will be able to invite, see and explore new possibilities. My head needs to be ready, my body, and my spirit. I need basic skills and knowledge. Going into a meeting, I find the delicate balance of knowing what I need to know, but not investing time and energy into what I do not need to know, trusting that others will bring that intelligence. There are many meetings I attend where I do very little to familiarize myself with materials ahead of time. There are other meetings when I spend hours reviewing material, getting briefed by others to ensure I understand critical points. My head needs knowledge, but it also needs to be fully present in the meeting in order to perform well. That means that I have to look after my body. I need to pay particular attention to the amount and quality of sleep I get and eat good food that fuels me well. I also need to spend time “in” my body, doing physical things – walking, running, yoga, soccer, skiing. I also need to engage Me, the true essence of me beyond ego, that is my spirit. This Me knows what I am passionate about and reminds me when I take the time to listen. This Me knows when I am heading off track and lets me know, when I take the time to listen. This Me knows what the next natural step is when I am facing a dilemma, and lets me know, when I take the time to listen. I engage Me as I write in my journal or as I talk to myself on a walk. I support this by ensuring I have the energy needed by making sure my body is healthy and well, and not letting my head take control. This spirit piece is about balance, which means I need to give myself the gift of silence to hear what all three aspects of my being have to say. Part of my personal practice is meditation, simply sitting quietly without any pressure of having to figure anything out. Whether for a soccer game or a meeting, I am ready for whatever is wanting to happen if my preparation is balanced. My intention is to be nimble, able to serve the possibilities that emerge in every moment. What practices serve possibility in your life? The panic set in as we realized moments before our soccer game that the required game sheet and player cards were in a teammate’s living room. They could be retrieved – maybe – just in time to avoid forfeiting our game. Coach Tim hit the road – he knew it was a 7 minutes drive each way. We had 10 minutes until the formal start time. After that it was up to the referee. Tim had 10 minutes to run a 14 minute mission. We broke the bad news to the team. We were here to play a game that we could probably win, but we might default. We entered the field and began our usual warm up while Assistant Coach Dan spoke to the referee. As players, we were pretty sure that if we didn’t have the sheet and cards by game time, we would forfeit. It was a half-hearted warm up. The referee decided to start the game 10 minutes late, without forfeit, if the sheet and cards arrived by then. This grace period gave Tim 20 minutes to run a 14 minute mission. So there we were, with a much longer than usual warm-up, forever checking the clock as the numbers counted down. At first, it just felt strange to have more than 5 minutes to warm up, then the panic started to set in. After 15 minutes, Tim had not returned. I kept having to remind myself that my job, as a player, was to get ready for the game. But the game around the game was front and center when time was getting tight, with only 3 minutes left: Tim should not park, but drive right to the door and run in; we should send a fan to the door and run in the sheet and cards. Again, a reminder to get ready for the game. The extra ‘drama’ around this game was a distraction. When Tim did return, I had to be ready to jump on the field and play. With less than a minute to spare, after catching all possible red lights, Tim arrived with the game sheet and player cards. We played a shorter than usual game. The distraction didn’t win – we were ready for the game and won 4-0. 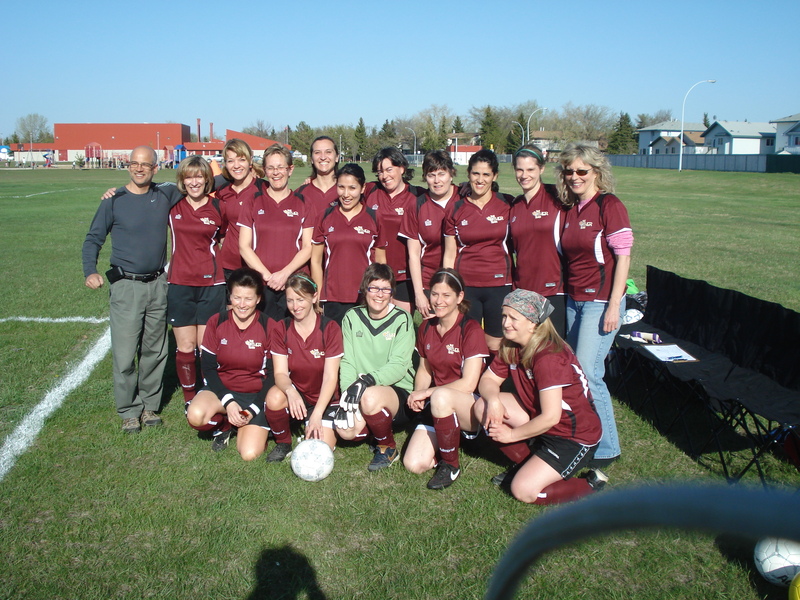 This soccer team is a group of neighbours and friends who decided to learn to play soccer in 2008. We practiced for a full year before fielding our first team in 2009. We have learned a lot along the way. My mate will only do her best if I give her the space she needs. To give her the space she needs, I must trust that she can do it. My worries about protecting our net harm my team’s ability to reach our goal. Trusting my mates makes me open to the play around me. The learning, as we field a team for our 5th season this summer, continues. I have learned that even when off the field, taking time for a rest, serves time on the field (Is it time to sub off?). At the end of season one, the words of my teammate Veronica reverberated: when I have the ball I can’t see anything else. Our discussions as a team revealed a lot about how our cities and neighbourhoods work too, about how we panic when its our turn with the ball, and how we don’t have to be comfortable with a situation to be able to see. We just need focus, flow and fun. There was a point when I realized that there is a game around the game: soccer isn’t really about soccer (the yellow card story). There are layers of game, and a field around the field. There is a game underway physically on the field bounded by the rules, and the strategy, influence, and even manipulation we engage in to either ignore the rules or turn them to our favour. We also learn, playing a physical game at our age (we range from 38 to 56), that we each take turns having to sit on the sidelines due to injury, losing our chance to play the game but gaining opportunities for other things. Two years ago, I received the gift of the sprained ankle, and a whole other perspective of the game: that in a given situation, I can put my energy into fighting or choose to look for unexpected avenues to explore. If I do something right, I want to hear about it. I need to know what I am doing right. If I do something wrong, I want to hear about it. I want to learn how to play the game better. It is really hard to hear that I am doing something wrong, but I want to hear it anyway. At times, people are not so good at delivering a message, but I will look past that because I want to hear what s/he has to say. We are growing as a team and a neighbourhood, on and off the field. Our relationships serve us in private and personal ways, and also professionally. Our relationships surface in our work in neighbourhood volunteering. Our families all connect too – it is a big soccer net supporting us and those around us. Our work is supporting the potential in each of us. What relationships support the potential in you? Our work in cities is about emerging possibilities. We are not planning our cities with linear processes, but rather we are organizing them. It is a messy process, murky and full of uncertainty. Where are we headed? How do we organize to find our way? I am sharing bits of the book I am working on, Nest City: The Human Drive to Thrive in Cities, here on my blog. For the last few months, I have been immersed in Part 2 – Organizing for Emergence, (Chapters 4-7), where I have been exploring the dynamics of how we organize ourselves. Cities are meant to be messy, requiring us to change and adjust as individuals and as a collective. Cities create uncertainty for us; they are a journey that is not meant to end, because they generate the conditions for our ongoing learning journey. You may find these 10 practices for the uneasy city journey helpful. We need to have a sense of where we are going in order to get “there”. It doesn’t mean we know exactly where we are going, but that we have a sense of direction. Purpose place a significant role in our development, both as a higher order purpose, or sense of direction, and as a specific purpose, a specific destination. Destination is both alive and adrift in us, for we know where we are going and we don’t know where we are going. In city life, the intrinsic value of each citizen is instrumental to the city. The purpose of the city is to allow us each to reach our full potentials as citizens, but that only happens when each citizen is pursuing the improvements we long to see. At every turn, on our way to a destination, thresholds emerge, challenging our understanding of the world and our interaction with it. Each threshold is a piece of the learning journey. Our exploration of thresholds allows us to emerge to new destinations. The never-ending journey to create cities that serve their inhabitants well is evident. We focus on what we want to achieve and we learn about how to get there and we learn along the way. We learn how things work ‘out’ in the world as well as ‘within’ us, and at every turn thresholds emerge to challenge our assumptions, our path, our very focus. In this dance, we revisit everything: our focus, what we are learning and what is emerging within and around us. This is the dance – FOCUS, LEARN and EMERGE. And this dance is dancing with the habitat that is both given to us, created by us, and forever in relationship with us. As we engage as individuals and collectives with in this dance, our nests change with us to meet our needs. The result of this dance is wonderful possibilities, both known and unknown. How well we dance, with self, other and our city nests, has an impact on the quality of the possibilities we create. This next round of posts will conclude Part 2 – Organizing for Emergence with pieces of Chapter 7 – Unknown Possibilities. These coming posts will knit together destination, journey and emergence to illuminate how we can unleash the possibilities that surround us – for ourselves and our cities. What possibilities do you see for your self, others and your city? When we work with passion, we feed ourselves joy. We also feed the city joy. It is up to all of us, whether we work as citizens, civic managers, civil society or city builders and developers, to make the city full of what we want: joy. Each of us, in our own ways, when we chase what we are passionate about make remarkable contributions to our places where we live together. When we are full of freedom, growth and joy, so too are our cities. When we align ourselves with our work, great cities that serve us well will emerge, because our work is aligned with our true selves. What we give our cities is what we receive in return. We create our cities, which create us. Indifference for indifference. Disdain for disdain. Compassion for compassion. Freedom, growth and joy for freedom, growth and joy. Beauty, truth and goodness for beauty truth and goodness. I am spending this week in Banff, Alberta for the Canadian Institute of Planners’ national conference. In my official capacity as president of the Alberta Professional Planners Institute, I welcome 800 planners from across Canada, and some special guests from the United States and Australia. We work in urban and rural settings, north and south. We work in agriculture and urban design. Some focus on policy, others on implementation. Collectively, we work in many areas, at every scale. Collectively we also share an itch – an itch to find and implement better ways of organizing ourselves and our cities to work better. This itch is not unique to our planners. It is an integral aspect of humanity. We aim, endlessly, to improve our lot. This is the essence of an impulse within us to grow and develop. Specific to our cities and communities, this is what 800 planners are gathering for this week. We are telling stories about our itches and how we scratched them. We will also, informally, while we visit with each other around the formal aspects of a conference, notice new itches. At this point, the choice will be about what we do with the itch. Sometimes, the best thing to do is ignore the itch and let it go away. Other times, the best thing to do is scratch the itch, invite more itch, invite the discomfort that comes with learning something new. I’m curious to see what we will itch this week, and the itches I/we will choose to scratch. Here are the highlights of how Part 2 – Organizing for Emergence is organized. Chapters 4-6 each focus on one of the circles in this diagram: journey, destination, emergence. Chapter 7 explores their relationship with the city’s habitats from Part 1, our economic life, social habitat and physical habitat. Chapter 4 – An Uneasy Journey recognizes that change and adjustment within ourselves to co-create cities that serve us well is a very personal journey. Both as individuals and as a collective. This is a journey that is not meant to end. It is a journey full of uncertainty. By naming and exploring this reality of organizing cities we can find ways to allow this uncertainty serve us, rather than hinder us. Chapter 5 – Destination Alive or Adrift teases out the role of destination as we organize our selves and cities. Knowing where we are going does not mean we know exactly how we will get there and this compels a different way of being and thinking. It will take practice. Chapter 6 – Emerging Thresholds explores the role of bravery and risk as well stand at the threshold of organizing ourselves for possibility to emerge. Chapter 7 – (Un)known Possibility wraps up Part Two of Nest City, reconnecting Chapters 4-6 to our social and physical habitat. The quality of this relationship has an impact on our abilities to release our fullest potential. Nest City is organized into three parts, each with a collection of chapters. Click here for an overview of the three parts of Nest City. Nancy Duarte, author of Resonate and Slide;ology, belives that we each have the power to change the world with our ideas. She notices that when an idea is embedded in a story arc, the audience gets attached to ideas and they take root. When a story is told, we physically react, and it is through this process that ideas take hold in us. Any presentation, then, is about the story and the audience. The story’s arc is grounded in the hero, but the hero is not the presenter, as we usually think: it is the audience. In her TEDx EAST talk, Duarte offers the perfect metaphor: the presenter is not young Luke Skywalker out to save the world, but his mentor, Yoda. The presenter is not the star of the show; the presenter is more like Yoda, who helps the audience move from one thing to another. The world is full of Lukes. There is not one Luke Skywalker that will save the world, but 7 billion. It is not up to one hero to make a difference, but the hero in each of us. Yoda intelligence is everywhere. There are, all around us, people with Yoda intelligence offering their wisdom to anyone willing to receive. The Luke in us works on inner well-being. As was the case with young Luke, heros have moments when they are frustrated and do not believe in themselves. In this mode they have great difficulty hearing the messages of their mentors. It is life’s journey to face difficulty and find peace and strength in such difficulty. The Yoda in us notices the right challenge at the right time for apprentices. Each of us will at several points in life play the role of mentor or coach. Our default is to imagine that we must provide direction to our apprentices, but recall Yoda, who sits patiently, waiting for Luke to learn at his own pace. He knows what challenge will, at the right time, best support Luke’s learning. And he remains ever calm and patient with the apprentice while the angst of learning is taking place. With so many Lukes and Yodas in the world, the odds are for us, not against us.